Our 6 day trip down the Colorado River through the Grand Canyon was EPIC. We took our teenagers for family bonding and found ourselves in a raft with several other wonderful families. Flotaing 6 days on the river and camping on the river banks at the bottom of the world's largest canyon is elemental in the way it connects you to the earth. I still feel the current when I sleep here at home. 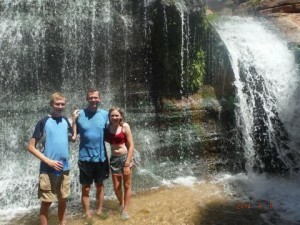 We enjoyed the day trips to water falls and swim spots very much. The chance to see Havasu Canyon was life altering. Also, the motorized raft let us cover extensive terrain during our 6 day trip. Our trip leader Craig Lutke, was amazing, fun, in charge and very experienced. In our boat, Ben was the guide. He was extremely knowledgeable about the Grand Canyon and filled our ride with wonderful anecdotes and learning. We heard the history of each rapid, why it was named such and who died first trying to ford it. He taught us about the geology of all layers of the Grand Canyon and we saw first hand how nature made it. Ben is also an amazing cook who fixed delicious dinners every night. Lindsay was our driver. She is a talented and beautiful woman straight out of the Title 9 catalog, who is extremely strong piloting a huge raft. She took us safely through many big rapids. We all felt very secure with her driving. She is also a great story teller and an amazing cook, even whipping up a birthday cake!